Coffee is not an extravagance, but rather a caffeinated beverage that transforms zombies to humans. Luckily, you don't have to pay much for coffee if you wake up void of life and energy, but one NYC restaurant is marking up the cost of your favorite drink to a gratuitous degree that will be sure to enrage all of your bearded barista friends. Eleven Madison Park, an award winning restaurant helmed by chef Daniel Humm, is willing to serve you one cup of coffee for the unforgiving price tag of $24. Drinking one cup of coffee for the cost of several might sound like a fool's errand, but the fancy java apparently earns its keep, owing largely to the fact that it's way better than Starbucks. There is a method to the madness: The ten-ounce cups are concocted by the restaurant's Coffee Director, who uses Colombian Wush Wush beans and a high-end coffee dripper to produce the much hyped brew. All the painstaking detail employed gives the coffee a "creamy texture that reminds me of dough or yogurt," the restaurant's Coffee Director Maya Albert told the Wall Street Journal. 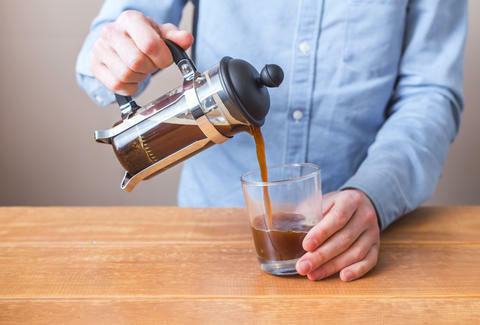 While it certainly won't endear itself to Bernie Sanders, Eleven Madison Park's brew -- which is served in portions of two cups for $48 -- might just be at the apex of overwrought coffee trends that've caught the popular imagination for years now. Which is to say, it's still just coffee. For everyone else, there's always the bodega.